In Punjab, Basant is also the festival of challenges, bravery and brotherhood. Basant Panchami became the festival of the brave and the martyrs. Maharaja Ranjit Singh held a special durbar on this particular day when the soldiers attended the parade in yellow uniforms. Shahid Bhagat Singh adopted the impelling song of Ram Parshad Bismal in the tradition of Rajput soldiers who left their homes to have tryst with death: Mera Rang de Basanti Chola, Maai mera rang de basanti chola (Give yellow hue to my dress, O Mother mine). Even now the brave nihang singhs, clad in the yellow robes emerge from the gurdwaras to display the warlike sports of Gataka and spear wielding. Twenty five kilometres from Ludhiana is located a small village of Sri Bhaini Sahib which embodied a rural life typical in the land of the five rivers. Around its fields, there existed a corporate life led by simple, God-fearing and innocent people. In Such a village was born the great Guru of the Namdhari Sikhs on Baisakhi in the year 1816. This was the day when the fields were green with the crops and the yellow flowers were dancing majestically from the stems of the plants. Guru Ram Singh grew up in such a house. He learnt Gurmukhi from his mother and he memorized many parts of the 'Bani.' 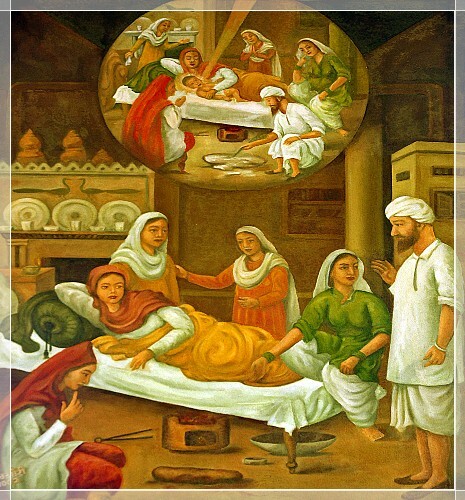 At the age of 9 Guru Ram Singh began to help his father in many works. While the other boys sang the village folk songs, this promising child always sang verses from the Granth. The others felt amused, then felt interested, and finally joined the religious-minded Guru Ram Singh in reciting the holy Verses. When the Sikhs were getting ready to start for the battle of Mudki in 1903 (Bikarmi) He was asked to pray for success. He stood for sometime facing the sun in a mood of ecstasy and declared. 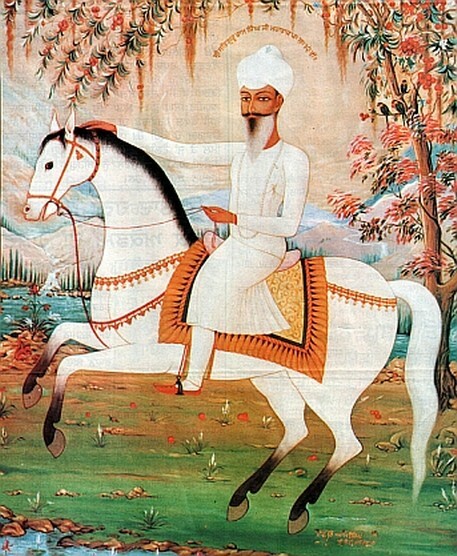 "Pray or do not pray the Sikhs are not going to win". The Prophecy proved true. When the Sikhs were about to fight at Mudki, Sri Satguru Ram Singh Ji threw his gun into the river (sutluj), and said that he had thrown it then, and others would throw theirs later on.